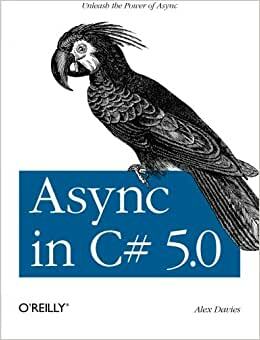 This book is for experienced C# developers that need to get a quick yet in depth look at what the new feature async in C# 5.0 means for their current and future projects. Alex is a coder, blogger and concurrency enthusiast from England. He currently works as a developer and product owner at Red Gate, working on tools for .NET developers. Before that, he did a degree in computer science at Cambridge University, and still has theoretical CS in his blood. In his spare time he writes an open source Actors framework for .NET, to let people write parallel programs more easily. First off, the reader assumes you have an extensive knowledge of async-like things like threading, which the user may not necessarily have. Second, this book contains little to no actual examples of using async/await. The examples that are provided are good, there should just be a LOT more of them. Finally, I felt that Alex overcomplicated some basic concepts. Async/Await isn't terribly hard to get your head around if you do it right (after a few online articles I understood it better). I will say Alex's book does a good job explaining some things like the compiler magic that takes place behind the scenes, as well as why you would wan to "async-ify" your codebase. Overall, it is a very short read and probably worth a quick glance. But you could probably gain as much knowledge from outside sources in shorter time! This book is great if you already have experience on asynchronous programming with the Task Parallel Library and want to keep up with the async/await technique. It is sort, with little examples to make its points across. It gave me a nice push in using this technique. Also, it discusses some of the gotchas, thing that apparently is missing in other books. Despite of having an introduction to parallel programming, this book it is not going to teach you how to get the most of parallel programming, how to plan your executions or the tidbits of synchronization. If you are just starting in parallel programming, I recommend you to read "CLR via C#" and continue with "Pro .NET 4 Parallel Programming in C#" (or newer). I have seen there are a newer book named "Pro Asynchronous Programming with .NET", unfortunately I have not read it. I would like to see more books like this, that basically are differential updates for people already familiar with the topic. With a book dedicated to Async, my assumption was that it would go deep into how to use Async, and the patterns to watch for. E.g. Dont' open a DB connection outside of a task, Best practise for catching and managing errors during parallel execution of tasks, etc. etc. I'm not done yet, but what I thought were complicated subjects were <20 page chapters which I think could be expanded with much more detail, and real life examples of where various techniques could be used. This is a short, cut to the chase book on Async programming in Winrt. I've been coding professionally since 1978, I've written plenty of fork/exec code in Unix but was looking for a quick start on Winrt Async. This is it. Not detailed or deep enough to be a constant reference, but for under 8 bucks (kindle version) I think it's a steal. Google for days trying to figure out Async, or grab this and spend a few hours getting everything you need to be writing code in what was for me an non-intuitive environment. It is a very complete theory book about the Async implementation in C#, but it lacks the practical examples I was looking for.